Are you intimidated by the thought of reading poetry? Do you want to learn more tips and techniques for reading it as a family? We are starting a new series at Poetry Teatime on how to read a poem. Today, we'll be talking about the very first things you can do when you start to read a poem. Last month, we talked about the two basic types of poetry: formal and free verse. We also discussed what to keep in mind when reading those different types of poems. Check out that post here. Today, it’s time to actually crack open our poetry books and dive in. So let's get started! As we get into the nitty-gritty details of how to read a poem, you may want to have our guide on poetic terms with you in case you come across some terminology that you don’t know. Remember that each poem is different, so you may need to switch the order of the steps below or even skip some steps. Don’t get overwhelmed if you don’t “get it” at first. Focus on what you do understand and take it from there! 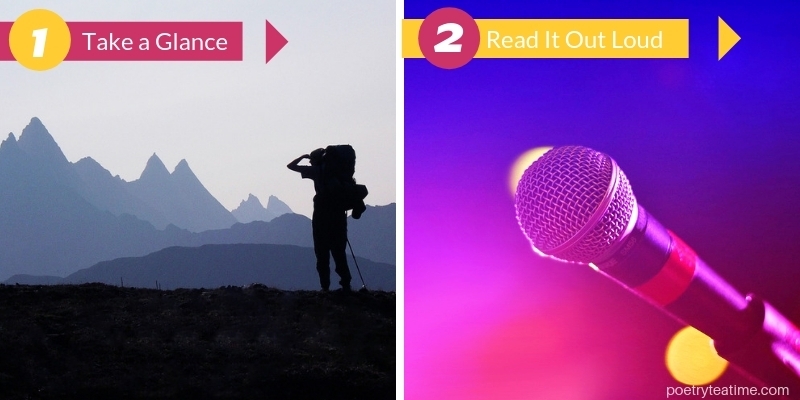 Because poetry is such a visual form of writing, you can learn a lot from your first look. Before you even start to read, glance over the whole poem. Is it a formal poem or a free verse poem? You’ll usually be able to tell the difference because formal poetry has regular-looking line lengths and stanzas, while free verse can be a mixture of short and long lines and stanzas. Is the poem long or short? If it’s a long poem, it’s more likely to have a plot and things that happen (more on that in next week's post). It might also take longer to read and understand. Is there anything else you notice about the look of the poem? Anything you’re curious about? Make a note (either in your mind or on paper) of things that stick out to you visually. We’ll explore why the poet made those choices later on. 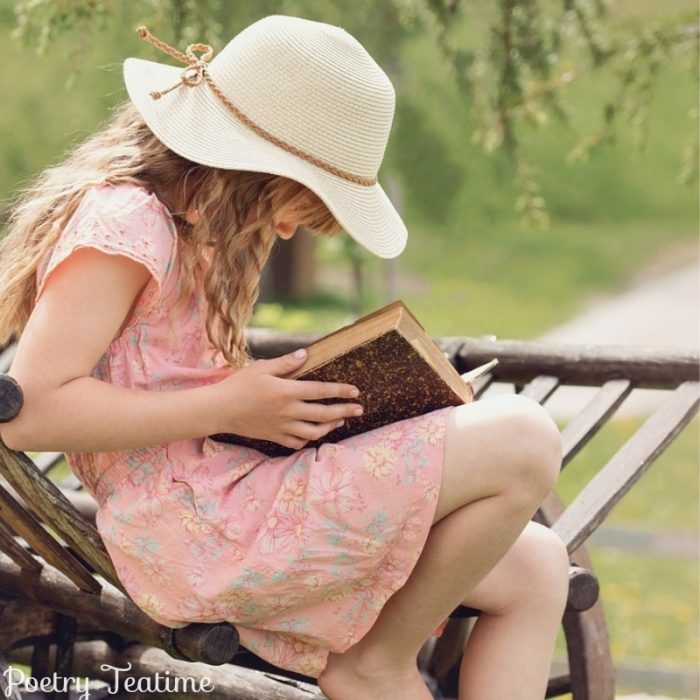 The next step in reading a poem is to actually go ahead and read it! We suggest reading it out loud first. Most poems are written with lots of interesting sounds that make it fun to read out loud. Also, free verse poetry often uses spoken rather than written grammar, so you’ll be ahead of the game in making sense of it. How do you read a poem out loud? First of all, relax! Poetry isn't actually a secret code, although some poems might look like they are! When you read a poem, read it in your normal conversational voice. Using your normal voice will make understanding the poem much easier. Next, follow the punctuation, not the line breaks. Don't pause at the end of the line unless there's a punctuation mark there. Enjoy any special sound-tricks the poet has included, whether it's rhymes, alliteration, repetition, or rhythm. Pay attention to these moments, because the poet often uses repeated sounds to call our attention to the most important parts of the poem. As you go along, don’t worry too much about pronouncing unfamiliar words. If there’s something you don’t know, either see if you can figure out what the word means from the context or move on unless you think it’s absolutely essential to know that word. We’ll have a chance to actually look up words later on. Last but not least, re-read the poem. Poems pack so much meaning into every single word. Try reading it again silently or reading it one stanza at a time as you move on to the next few steps. For more tips on reading poetry aloud, check out this post. And that's all for today's tips on getting started with reading a poem! 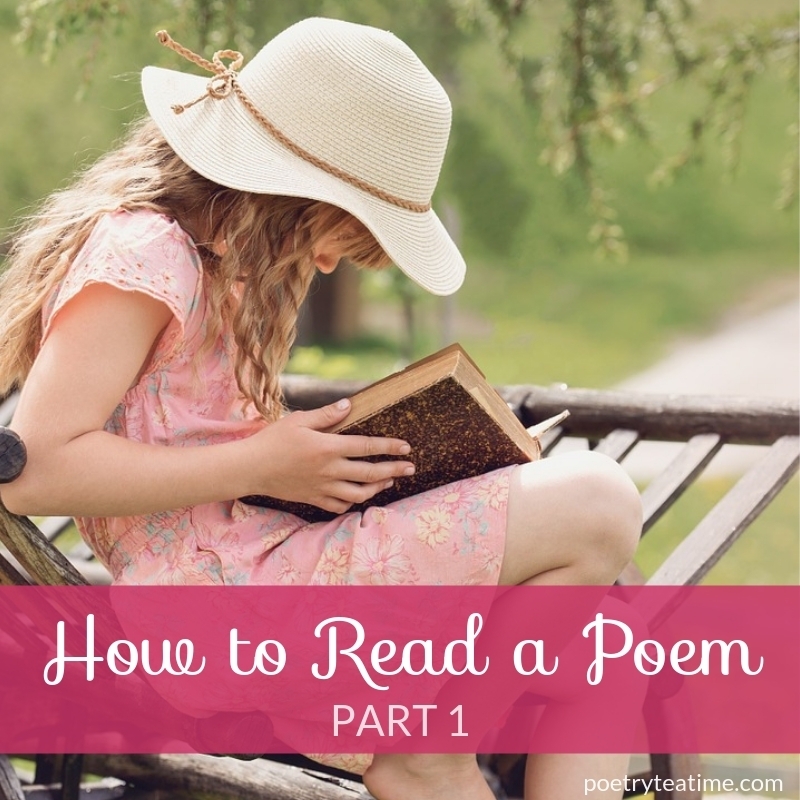 Be sure to check out this post for the next step of how to read a poem.